Do you suffer from tight or stiff muscles? Then these workshops are for you! 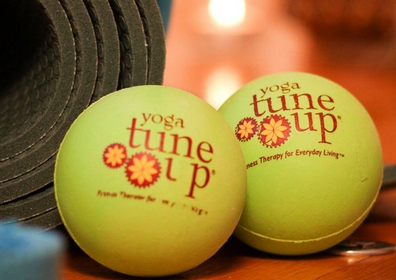 Learn the art of self massage using Yoga Tune Up® Balls. This 1.5 hr workshops will provide you with a partial body self massage practice, that will help improve mobility and increase blood flow to your muscles and joints. These workshops will focus on the entire body, one section at a time. Yoga Tune Up® balls will be provided with this workshop. DOES NOT INCLUDE THE 2 Massage Therapy Balls @ $25 CASH AT THE WORKSHOP. Or BYOB if you have it! In this 1.5 hr workshop, learn tips and tricks to help target and relax tight muscles through self massage using Roll Model® Massage Therapy Balls. We will explore the body’s top tight spots from feet-to-head leaving you feeling relaxed and supple. You will learn how to find your “cranky” spots and techniques for self massage leaving you with the self care knowledge for at home application. DOES NOT INCLUDE THE 1 ALPHA Therapy Ball @ $25 CASH AT THE WORKSHOP. In this 1.5 hr workshop, learn tips and tricks to help relax, stretch and strengthen tight Leg and hip muscles through self massage, using Roll Model® Massage Therapy Ball, and specialized mobility work. We will explore the sometimes neglected leg muscles and main hip muscles that contribute to limited mobility, knee and ankle pain, leaving you feeling relaxed and more mobile. At the end of this workshop you should leave with techniques on increasing mobility, pain reduction, injury prevention and self care for at home application.